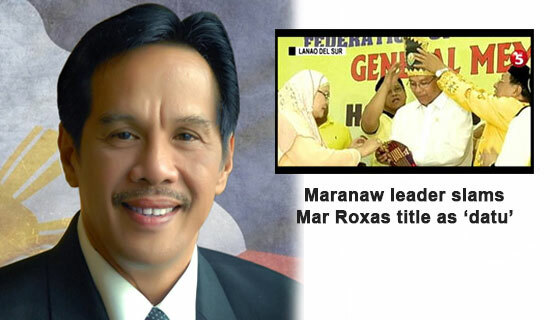 The Maranaw leader of the Lanao del Sur was reacted on the honorary title of datu to Liberal Party standard bearer Mar Roxas. The son of the late Lanao del Sur Representative Haroun Al-Rashid Lucman took his social media account to expressed his thoughts about the issue. Norodin Alonto Lucman said on his interview on Inquirer yesterday January 13, "I will never grant that title to a proven Islamophobe. The Sultanates must condemn this treachery against the dignity of our forebears." Lucman also urged the Mindanao royal houses members to "condemn the act of the Sultanate of Lanao" to enthrone Mar Roxas as "Datu" or "Sultan". In his facebook account, Lucman posted his thoughts about the said issue. He said in his post that he has nothing personal against administration standard bearer Mar Roxas. I grieve for the martyrdom of thousands of our people, including my father, who died for the survival of our faith and our heritage. I have nothing personal against Mar Roxas. But this is beyond politics where our honor and dignity as a nation is dragged into the pits of ignorance, scandals and bribery. Our history and cultural heritage is what is left, after all is said and done, to define us as proud people of the lake, with distinct nationality, Constitution and religious identity. The people of Pres. Cory Aquino could have asked me to help in recognizing Cory Aquino as worthy of being enthroned as Bai A Labi of the Sultanates of Mindanao and Sulu.. Not the way they routinely handed me a piece of paper and include in my speech the proclamation of Cory Aquino as Bai a Labi. Who am I to insult my heritage and drag the president to ignominy? I know I can ask my relatives in the 16 Royal Houses of Lanao and the 28 Royal members of the Legislature to discuss the issue among themselves and come up with their decision. And then move on to consult the Sultans of Sulu, Maguindanao, Kabuntalan and Buayaan as my father did during his lifetime. Cory Aquino is worthy of our respect because of Ninoy and what she achieved in restoring democracy in our country. The pageantry and the colorful ceremonies would have been a showcase of Mindanao's cultural past and proud history. The enthronement would have been held in Kotawato, or Buadi Sakayo (Dansalan) or Jolo, the seat of the Sulu Sultanate. Sadly, that was nother opportunity missed, a chance to recognize the Bangsamoro people as part of the Republic. Lucman give also a comment to his post and said, "We will all die sometime and we don't want to violate the spirits of our ancients, and the mercy of Allah subhanahu wa taalah." Do you agree with Maranaw leader Norodin Alonto Lucman? Share your thoughts below. Comments or suggestions about "Maranaw leader reacted to Mar Roxas as 'Datu or Sultan'" is important to us, you may share it by using the comment box below.